If you’re looking for a place to stay in the town of Carcassonne, your search is over: our 3-star Hotel Kyriad offers you modern accommodations from which you can explore the magnificent city of Carcassonne, a medieval city recognized as a UNESCO world heritage site. Located in the center of the new activity park, the hotel is 10 minutes from downtown. There you will find a shopping center with more than 100 stores and restaurants in our immediate vicinity. Sports lovers will also be thrilled to find a gym at a 10-minute walk from the hotel. Our establishment is easily accessible ‒ the highway, airport and train station are just a few minutes from our hotel ‒ making it the ideal point of departure to visit the region's chateaus, abbeys and vineyards. Toulouse, Montpellier, Perpignan and the beaches of the Mediterranean are all just a stone’s throw away, as well as the ski hills and Spanish border that are about an hour-and-a-half away by car. We offer free fenced-in parking (closed at night) that can accommodate buses. The 79 comfortable rooms at our hotel are air conditioned and soundproofed. They offer many quality amenities, starting with high quality bedding. The hotel restaurant is ideal for dining with friends, family or colleagues. On the menu: local products, seasonal menu and children's menu. The hotel also offers a lively bar with theme drinks. To start the day, enjoy our breakfast buffet in our air-conditioned dining room or on our lovely shaded terrace. Our 3-star Kyriad Hotel welcomes you in a warm and authentic atmosphere. Reception is open every day, 24/7, and our staff can speak the main European languages. The hotel has earned the "Quality Tourism" label. We love children and can lend you various children’s items and games upon request. 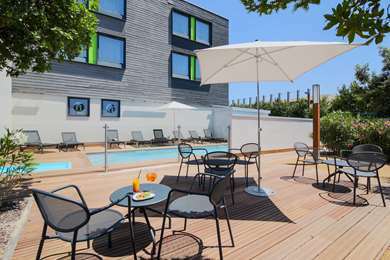 Hotel Kyriad Carcassonne – Aéroport is designed for comfort. Our 79 rooms (twin or double) are equipped with premium bedding (one queen bed or two twin beds) and a desk. We also have connecting rooms available and offer specially equipped rooms for people with reduced mobility, as well as childcare equipment. A courtesy tray is provided in every room. Spend a pleasant night in our soundproof air-conditioned rooms, with a flat screen TV and foreign channels, Canal+, and Wi-Fi access. In the morning, opt for the all-you-can-eat breakfast buffet (hot, cold, sweet and salty) or for the quick breakfast offered every day until noon. For your stay in the city of Carcassonne, look no further. Offering a friendly atmosphere with security, comfort and entertainment, our hotel provides all the services you need for your wellbeing. Aside from theatres, cinemas, discotheques, bars and restaurants, you will find a golf course, a gym and a swimming pool just a few minutes away. First thank you to taking time to write your comment about our hotel . We are happy to know that you enjoed your stay in our hotel. We hope to welcome you again . Basic for a Kyriad and certainly in a budget-style building but has a few of the Kyriad extras that punt it above the budget alternatives. Decent touches are pleasant staff, softish towels, good bedding and a hair dryer. My main reason for choosing was none of the budgets normally have the subscriber TV channels and I was desperate to see the Mexican F1 Grand Prix live. Yes I did in the usual Kyriad style. Just as good was the provision of scrambled egg and bacon slices at breakfast which were a cut or two above those at the B&B chain. Only negative was that it was a little difficult to find on its industrial location even with a satnav but that is par for the course with budget hotels. Thumbs up from me and would return. We are happy if you enjoyed your stay in our hotel . Hope to welcome you again for your next stay in France.